Great news if you didn’t qualify for Rolex this year, but you still want to ride cross country at the Kentucky Horse Park — It’s Festival year! Pack up your family and come to Champs in 2017. 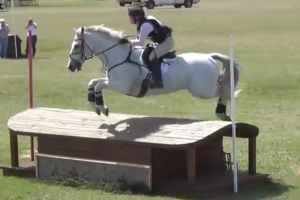 To qualify for Eventing Championships, a rider must have completed (without elimination in any phase) two Horse Trials. One of these can be your region’s Eventing Rally and one must be a recognized USEA HT; or two recognized USEA Horse Trials. One of the competitions must be clear of any cross country jumping penalties and the other may have no more than 20 cross country jumping penalties. For competitors who complete only two recognized USEA Horse Trials, they must submit an exception documenting Vet Box knowledge and Horse Management from another rally. • Age as of January 1, 2017, certification as of closing date of qualifying rally. Entrant must have competed in the qualifying rally at the certification required for that division/discipline. • All Championships Competitors must be in compliance with USPC Policy #1002, Member in Good Standing.